Next I would like to introduce to you Nicole from Sweet Pickle Designs. If you have been a follower of my blog for awhile you would probably recognize Nicole as one of the amazingly talented duo that makes up Crafty Sisters. While Crafty Sisters is full of all their crafty adventures, Sweet Pickles Designs is Nicole's wood craft business. 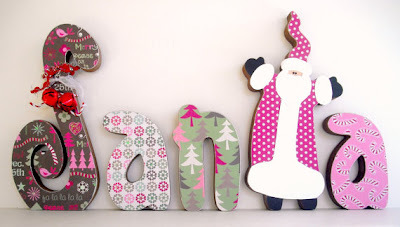 She makes beautiful word cut outs and other fun seasonal crafts. And the best part is you can purchase most of them both finished and unfinished. 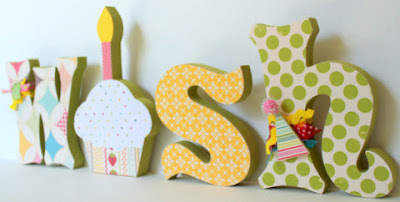 Here are a few favorites from Sweet Pickle Designs shop. Nicole has so kindly offered to give one of you her latest creation, a family picture holder! Isn't it so cute! It has little clips on the back so that you can change out the pictures as often as you like. What a fun additions to any vignette. Please keep in mind that the ribbon and paper on the actual prize may vary from the one pictured above. Visit Sweet Pickle Designs on Etsy, look around and leave me a comment telling me your favorite item. Be a follower of Sweet Pickle Design blog.